I realized that from my tweets and Facebook posts (thanks Facebook Timeline) – I often go outside of the realm of being a nerd and display all sort of passion on travel, outdoor stuff, and of course food! So one of the things, I’m going to start adding to my repertoire of blog posts will be Foodie Friday. Every Friday (well, maybe every 2nd Friday), I’ll blog post about some awesome food that I like and that you may want to try! So for my first post, let’s talk about 芋圓 – also known as taro circles. In Taiwanese – it’s pronounced like ong-yi. Taiwan is famous for many of its 小吃 – or “small eats”. Instead of eating a large portion of one particular item, the key is to have many small portions of A LOT of different variety. You walk to down the many 夜市 – night markets – in any almost any Taiwanese cities – and there are tons of small vendors that make just a few items – specializing in it – for a matter of years. It’s the old adage of the old Taiwanese cook that has used the same iron pot for 30 years to make fried rice. But the fried rice tastes better because the pot has many different layers of the same fried rice made the same way for the last 30 years. 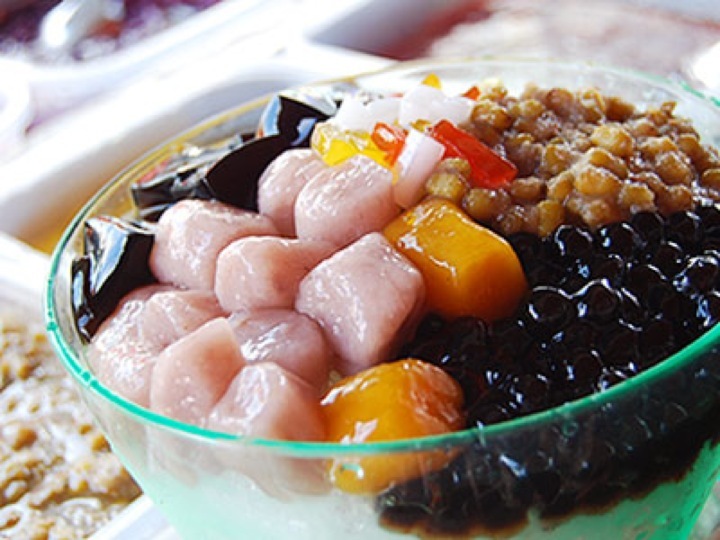 So back to the 芋圓 – basically it’s a simple dessert made typically made with multi-colored taro circles, herbal black jelly, tapioca, green beans and/or red beans on top of crushed ice swimming in sugar / glucose water. Yet, it is deliciously yummy and very light – very typical of many Taiwanese desserts. There are many locations in Taiwan and you pretty much find it at any night market and there are usually plenty of stands on every major street. Typical of many Taiwanese foods, people will have different takes and preferences – and debate adamantly about which stand serves better 芋圓 than another. There could be three stands all next to each other – and you’ll see the vast majority of people lined up at just one of those stands just because it was the first, or has the better red bean, or better peanuts, or better taro, etc. etc. P.S. if you ever are in 斗六, do check out 青麥芋圓 and order the 芋圓 #4 and #5. Enjoy! YUMMMM =) I love Taiwanese taro & yam balls! Do you know if there’s an actual English term/name for this dessert? I’m afraid I do not know what it is ;-). If you find out, please do comment / tell me, eh? !